It means we provide Local SEO services for you from Collierville TN. Your business can be located anywhere in the USA. We just like it here, a short drive from the home of Elvis and the birthplace of Rock’n Roll. We like it here because the tap water is delicious thanks to the Memphis aquifer. Our clients are spread across the USA. Our knowledge is squired from around the globe. Check out the Collierville Events page for in person happenings. Collierville is a town in Shelby County, Tennessee, United States, and a suburb located in the Memphis metropolitan area. The town of Collierville had a population of 43,965 at the 2010 census. Our founder, Scott Finney, moved 5 miles east from Germantown to Collierville while in high school in 1996. Collierville will become part of the Interstate 69 highway plan integrating Bill Morris Parkway (SR 385) as Interstate 269, part of this USDOT project linking Canada and Mexico with the United States. As of the 2000 census, there were 31,872 people, 10,368 households, and 8,937 families residing in the town. Collierville’s traditional destination for visitors is the Historic Square, in the center of downtown. This quaint shopping destination boasts trendy shops, fun eateries, and a tree-lined park, all overlooking the old train depot from which the town grew. Main Street Collierville was established in 1870. Have you had a chance to visit Collierville? What are we forgetting to mention? You can meet our founder and hear how Drop the strap was all started on the bottom of the homepage. 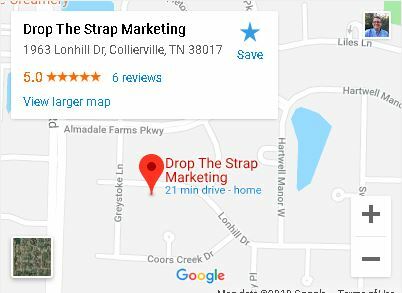 Coming Soon: The Drop The Strap Guide to Collierville Advertising Opportunities. We are compiling the list now. Look for it to publish in the next few weeks.